Old Norse was a North Germanic language that was spoken by inhabitants of Scandinavia and inhabitants of their overseas settlements during about the 9th to 13th centuries. Old Norse was divided into three dialects: Old West Norse, Old East Norse and Old Gutnish. Old West and East Norse formed a dialect continuum, with no clear geographical boundary between them. For example, Old East Norse traits were found in eastern Norway, although Old Norwegian is classified as Old West Norse, and Old West Norse traits were found in western Sweden. Most speakers spoke Old East Norse in what is present day Denmark and Sweden. Old Gutnish, the more obscure dialectal branch, is sometimes included in the Old East Norse dialect due to geographical associations. It developed its own unique features and shared in changes to both other branches. The 12th-century Icelandic Gray Goose Laws state that Swedes, Norwegians, Icelanders and Danes spoke the same language, dǫnsk tunga ("Danish tongue"; speakers of Old East Norse would have said dansk tunga). Another term used, used especially commonly with reference to West Norse, was norrœnt mál ("Nordic speech"). Today Old Norse has developed into the modern North Germanic languages Icelandic, Faroese, Norwegian, Danish and Swedish, of which Norwegian, Danish and Swedish retain considerable mutual intelligibility. In some instances the term Old Norse refers specifically to Old West Norse. Various other languages, which are not closely related, have been heavily influenced by Norse, particularly the Norman dialects, Scottish Gaelic and Irish. Russian, Belarusian, Lithuanian, Finnish, Latvian and Estonian also have a number of Norse loanwords; the words Rus and Russia, according to one theory, may be named after the Rus' people, a Norse tribe; see Rus (name), probably from present-day east-central Sweden. The current Finnish and Estonian words for Sweden are Ruotsi and Rootsi, respectively. Faroese retains many similarities but is influenced by Danish, Norwegian, and Gaelic (Scottish and/or Irish). Although Swedish, Danish and the Norwegian languages have diverged the most, they still retain asymmetric mutual intelligibility. Speakers of modern Swedish, Norwegian and Danish can mostly understand each other without studying their neighboring languages, particularly if speaking slowly. The languages are also sufficiently similar in writing that they can mostly be understood across borders. This could be because these languages have been mutually affected by each other, as well as having a similar development influenced by Middle Low German. The vowel phonemes mostly come in pairs of long and short. The standardized orthography marks the long vowels with an acute accent. In medieval manuscripts, it is often unmarked but sometimes marked with an accent or through gemination. All phonemes have, more or less, the expected phonetic realization. Sometime around the 13th century, Ǫ (/ɔ/) merged with Ø or O in all dialects except Old Danish. In Icelandic, all Ǫ merged with Ø. This can be determined by their distinction within the 12th-century First Grammatical Treatise but not within the early 13th-century Prose Edda. The nasal vowels, also noted in the First Grammatical Treatise, are assumed to have been lost by this time. See Old Icelandic for the Œ > Æ and Ę > E mergers. Old Norse has six plosive phonemes. Of these /p/ is rare word-initially and /d/ and /b/ are realized as voiced fricative allophones between vowels, except in compound words (e.g. veðrabati), already in the Proto-Germanic language (e.g. *b *[β] > [v] between vowels). The /a/ phoneme is realized as [ɡ] after an n or another g and as [k] before /s/ and /t/. It is realized as a voiced velar fricative [ɣ], by some accounts inside words, and by others between vowels (and otherwise as [ɡ]). The Old East Norse /ʀ/ was an apical consonant whose position isn't precisely known, being reconstructed as a palatal sibilant:2. It descended from Proto-Germanic /z/ and eventually developed into /r/, as it already had done in Old West Norse. The consonant digraphs hl, hr, hn occurred word-initially. It is unclear whether they were sequences of two consonants (with the first element realised as /h/ or perhaps /x/), or as single voiceless sonorants /l̥/, /r̥/ and /n̥/ respectively. In Old Norwegian, Old Danish and later Old Swedish the groups hl, hr, hn were reduced to plain l, r, n, suggesting that they were most likely realised as voiceless sonorants by Old Norse times. The pronunciation of hv is unclear, and may have been /xʷ/ (the Proto-Germanic pronunciation), /hʷ/ or /ʍ/. Unlike the other three groups above, it was retained much longer in all dialects, and never developed into a voiceless sonorant in Icelandic, but instead "hardened" to a plosive /kv/. This suggests that it was not a voiceless sonorant, but retained stronger frication. Unlike Proto-Norse, which was written with the Elder Futhark, runic Old Norse was originally written with the Younger Futhark, which only had 16 letters. Because of the limited number of runes, the rune for the vowel u was also used for the vowels o, ø and y, and the rune for i was used for e. Medieval runes came into use some time later. As for the Latin alphabet, there was no standardized orthography in use in the Middle Ages. A modified version of the letter wynn called vend was used briefly for the sounds /u/, /v/, and /w/. Long vowels were sometimes marked with acutes, but also sometimes left unmarked or geminated. The standardized Old Norse spelling was created in the 19th century, and is for the most part phonemic. The most notable deviation is that the non-phonemic difference between the voiced and the voiceless dental fricative is marked — the oldest texts as well as runic inscriptions use þ exclusively. Long vowels are denoted with acutes. Most other letters are written with the same glyph as the IPA phoneme, except as shown in the table below. Modern Swedish, Danish, and Norwegian have two registers reflected in differing pronunciation of the stressed syllable of words. In Swedish and Norwegian, the registers are reflected in different tones (i.e. through tonal word accent), while in Danish the difference is the presence or absence of stød, a glottal gesture considered a kind of creaky voice that seems to have been documented by Swedish sources as early as the 16th century. What is here called class 1 is reflected as tone 1 in Norwegian, acute accent in Swedish, and presence of stød in Danish, whereas class 2 words have tone 2 in Norwegian, grave accent in Swedish, and no stød in Danish. No sign of any tonal system is found in Icelandic or Faroese. Suffixing a definite article onto class 1 words does not change their class, suggesting that the register distinctions developed before the definite article fused with the noun. Hence Old Norse and-inn "the duck" > Swedish class 1 anden, but andi-nn "the spirit" > class 2 anden. The Old Norse non-syllabic morpheme -r after a consonant later became syllabic through the epenthesis of a vowel, without changing the class. Hence Old Norse bœndr "farmers" > Norwegian class 1 bønder, but baunir "beans" and bœnir "prayers" both > Norwegian class 2 bønner (homophonous with bønder except for the pitch difference). Many later polysyllabic loanwords in the various languages have acquired class 1. Some /y/, /yː/, /ø/, /øː/, /ɛ/, /ɛː/, /øy/, and /ɛi/ were obtained by i-umlaut from /u/, /uː/, /o/, /oː/, /a/, /aː/, /au/, and /ai/ respectively. Others were formed via ʀ-umlaut from /u/, /uː/, /a/, /aː/, and /au/. U-umlaut is more common in Old West Norse in both phonemic and allophonic positions, while it only occurs sparsely in post-runic Old East Norse and even in runic Old East Norse. Compare West Old Norse fǫður (accusative of faðir, father), vǫrðr (guardian/caretaker), ǫrn (eagle), jǫrð (in Modern Icelandic: jörð, earth), mjǫlk (in Modern Icelandic: mjólk) with Old Swedish faður, varðer, örn, jorð and Modern Swedish örn, jord, mjölk with the latter two demonstrating the u-umlaut found in Swedish. This is still a major difference between Swedish and Faroese and Icelandic today. Plurals of neuters do not have u-umlaut at all in Swedish, but in Faroese and Icelandic they do, for example the Faroese and Icelandic plurals of the word land, lond and lönd respectively, in contrast to the Swedish plural land and numerous other examples. That also applies to almost all feminine nouns, for example the largest feminine noun group, the o-stem nouns (except the Swedish noun jord mentioned above), and even i-stem nouns and root nouns, such as Old West Norse mǫrk (mörk in Icelandic) in comparison with Modern and Old Swedish mark. When a noun, pronoun, adjective, or verb has a long vowel or diphthong in the accented syllable and its stem ends in a single -l, -n, or -s, the -r (or the elder r- or z-variant ʀ) in an ending is assimilated. [V 4] When the accented vowel is short, the ending is dropped. The nominative of the strong masculine declension and some i-stem feminine nouns uses one such -r (ʀ). Óðin-r (Óðin-ʀ) becomes Óðinn instead of *Óðinr (*Óðinʀ), but karl-r (karl-ʀ) remains karl. Blása, to blow, has blæss for "you blow" instead of *blæsr (*blæsʀ). The rule is not hard and fast, with counter-examples such as vinr, which has the synonym vin, yet retains the unabsorbed version, and jǫtunn, where assimilation takes place even though the root vowel, ǫ, is short. Words with a final r in the word stem, such as vetr, do not add another -r, as the sounds are already the same. The effect of the dropping usually results in the lack of distinction between some forms of the noun. In the case of vetr the dropping renders the nominative and accusative singular and plural identical; the nominative singular and nominative and accusative plural would otherwise have been *vetrr (*vintrʀ), while the accusative singular would still have been vetr. This is because the 3rd strong masculine declension, to which it belongs, marks the nominative singular and nominative and accusative plural, but not the accusative singular, with inflectional ʀs. Old Norse had three grammatical genders – masculine, feminine and neuter. Adjectives or pronouns referring to a noun must mirror the gender of that noun, so that one says, "heill maðr!" but, "heilt barn!" Like in other languages, the grammatical gender of an impersonal noun is generally unrelated to an expected natural gender of that noun. While indeed karl, "man" is masculine, kona, "woman", is feminine, and hús, house, is neuter, so also are hrafn and kráka, for "raven" and "crow", masculine and feminine respectively, even in reference to a female raven or a male crow. The gender of some words' plurals does not agree with that of their singulars, such as lim and mund. [V 5] Some words, such as hungr, have multiple genders, evidenced by their determiners being declined in different genders within a given sentence. Old Norse inherited the Proto-Germanic feature of having neuter as the default gender. This means that when the gender of a noun is unknown, adjectives and pronouns referencing it use the neuter gender forms, rather than the masculine or feminine. Thus, if speaking or writing to a general audience, one would say velkomit, "well is it come," rather than velkominn or velkomin, "well is [he or she] come," as one does not know whether the person hearing it is going to be male or female. One generally sees adjectives in their neuter form when used pronominally for this reason. For words more commonly used in this way (rather than to describe a noun) one sees their neuter forms more often than their masculine or feminine. Normally the masculine form would be the most beneficial form of an adjective to learn first, given that the majority of nouns are masculine. In these cases, however, the most practical form to learn first would be the neuter. Nouns, adjectives and pronouns were declined in four grammatical cases — nominative, accusative, genitive and dative, in singular and plural numbers. Adjectives and pronouns were additionally declined in three grammatical genders. Some pronouns (first and second person) could have dual number in addition to singular and plural. The genitive is used partitively, and quite often in compounds and kennings (e.g. : Urðarbrunnr, the well of Urðr; Lokasenna, the gibing of Loki). In addition to these examples there were the numerous "weak" noun paradigms, which had a much higher degree of syncretism between the different cases in its paradigms, i.e. they had fewer forms than the "strong" nouns. A definite article was realised as a suffix, that retained an independent declension e.g. troll (a troll) – trollit (the troll), hǫll ( a hall) – hǫllin (the hall), armr (an arm) – armrinn (the arm). This definite article, however, was a separate word, and did not become attached to the noun before later stages of the Old Norse period. Old West Norse and Old Gutnish did not take part in the monophthongization which changed æi (ei) into ē, øy (ey) and au into ø̄, nor did certain peripheral dialects of Swedish, as seen in modern Ostrobothnian. Another difference was that Old West Norse lost certain combinations of consonants. The combinations -mp-, -nt-, and -nk- were assimilated into -pp-, -tt- and -kk- in Old West Norse, but this phenomenon was limited in Old East Norse. Some past participles and other words underwent i-umlaut in Old West Norse but not in Old East Norse dialects. Examples of that are Icalandic slegið/sleginn and tekið/tekinn, which in Swedish are slagit/slagen and tagit/tagen. This can also be seen in the Icelandic and Norwegian words sterkur and sterk ("strong"), which in Swedish is stark as in Old Swedish. These differences can also be seen in comparison between Norwegian and Swedish. In Iceland, initial /w/ before /ɾ/ was lost. [V 6] Compare Icelandic rangur with Norwegian vrangr, OEN vrangʀ. This change is shared with Old Gutnish. 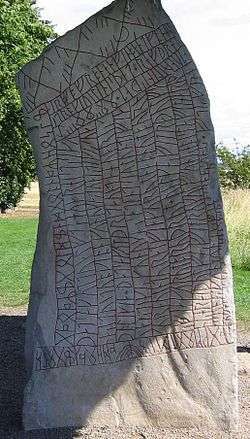 Old East Norse, between 800 and 1100, is in Sweden called Runic Swedish and in Denmark Runic Danish. The use of Swedish and Danish is not for linguistic reasons as the differences between them are minute at best during the more ancient stages of this dialect group. Changes had a tendency to occur earlier in the Danish region and until this day many Old Danish changes have still not taken place in modern Swedish rendering Swedish as the more archaic out of the two concerning both the ancient and the modern languages, sometimes by a profound margin but in all differences are still minute. They are called runic because the body of text appears in runes. Runic Old East Norse is characteristically archaic in form, especially Swedish (which is still true for modern Swedish compared to Danish). In essence it matches or surpasses the archaicness of post-runic Old West Norse which in its turn is generally more archaic than post-runic Old East Norse. While typically "Eastern" in structure, many later post-runic changes and trademarks of EON had yet to happen. Vice versa, masculine i-stems with the root ending in either g or k tended to shift the plural ending to that of the ja-stems while OEN kept the original: drængiaʀ, *ælgiaʀ and *bænkiaʀ while OWN drengir, elgir (elks) and bekkir (modern Danish "drenge", "elge", "bænke", modern Swedish drängar, älgar, bänkar). Until the early 12th century, Old East Norse was very much a uniform dialect. It was in Denmark that the first innovations appeared that would differentiate Old Danish from Old Swedish:3 as these innovations spread north unevenly (unlike the earlier changes that spread more evenly over the East Norse area) creating a series of isoglosses going from Zealand to Svealand. At the end of the 10th and early 11th century initial h- before l, n and r was still preserved in the middle and northern parts of Sweden, and is sporadically still preserved in some northern dialects as g-, e.g. gly (lukewarm), from hlýʀ. The Dalecarlian dialects developed as Old Swedish dialects and as such can be considered separate languages from Swedish. If someone slays a Swede or a Smålander, a man from the kingdom, but not a West Geat, he will pay eight örtugar (20-pence coins) and thirteen marks, but no weregild. [...] If someone slays a Dane or a Norwegian, he will pay nine marks. If someone slays a foreigner, he shall not be banished and have to flee to his clan. If someone slays a foreign priest, he will pay as much as for a fellow countryman. A priest counts as a freeman. If a Southerner is slain or an Englishman, he shall pay four marks to the plaintiff and two marks to the king. Due to Gotland's early isolation from the mainland, many features of Old Norse did not spread from or to the island, and Old Gutnish developed as an entirely separate branch from Old East and West Norse. For example, the diphthong ai in aigu, þair and waita was not retroactively umlauted to ei as in e.g. Old Icelandic eigu, þeir and veita. Breaking was especially active in Old Gutnish, leading to forms such as bjera and bjauþa, mainland bera and bjúþa. Dropping of /w/ in initial /wɾ/ is shared only with Old Icelandic. So, by their own will, the Gotlanders became the subjects of the Swedish king, so that they could travel freely and without risk to any location in the Swedish kingdom without toll and other fees. Likewise, the Swedes had the right to go to Gotland without corn restrictions or other prohibitions. The king was to provide protection and help, when they needed it and asked for it. The king and the jarl shall send emissaries to the Gutnish thing to receive the taxes. These emissaries shall declare free passage for the Gotlanders to all locations in the sea of the king at Uppsala (that is the Baltic Sea was under Swedish control) and likewise for everyone who wanted to travel to Gotland. In a simple sentence like "They are both weak" the extent of the Old Norse loanwords becomes quite clear (Old East Norse with archaic pronunciation: "Þæiʀ eʀu báðiʀ wæikiʀ" while Old English "híe syndon bégen (þá) wáce"). The words "they" and "weak" are both borrowed from Old Norse, and the word "both" might also be a borrowing, though this is disputed. While the number of loanwords adopted from the Norse was not as numerous as that of Norman French or Latin, their depth and everyday nature make them a substantial and very important part of every day English speech as they are part of the very core of the modern English vocabulary. Words like "bull" and "Thursday" are more difficult when it comes to their origins. "Bull" may be from either Old English "bula" or Old Norse "buli", while "Thursday" may be a borrowing, or it could simply be from the Old English "Þunresdæg", which could have been influenced by the Old Norse cognate. The word "are" is from Old English "earun"/"aron", which stems back to Proto-Germanic as well as the Old Norse cognates. ↑ NB = Bokmål Norwegian, a mixture of Danish and pure Norwegian; NN = Nynorsk Norwegian, based on West Norwegian dialects and without Danish influence; No = same in both forms of Norwegian. 1 2 3 Vowel length in the modern Scandinavian languages does not stem from Old Norse vowel length. In all of the modern languages, Old Norse vowel length was lost, and vowel length became allophonically determined by syllable structure, with long vowels occurring when followed by zero or one consonants (and some clusters, e.g. in Icelandic, most clusters of obstruent to obstruent + [r], [j] or [v], such as [pr], [tj], [kv] etc. ); short vowels occurred when followed by most consonant clusters, including double consonants. Often, pairs of short and long vowels became differentiated in quality before the loss of vowel length and thus did not end up merging; e.g. Old Norse /a aː i iː/ became Icelandic /a au ɪ i/, all of which can occur allophonically short or long. In the mainland Scandinavian languages, double consonants were reduced to single consonants, making the new vowel length phonemic. 1 2 ⟨o⟩ or (before /r/) ⟨ø⟩ in some isolated words, but the tendency was to restore ⟨a⟩. ↑ When un-umlauted */u/ is still present elsewhere in the paradigm. ↑ When not followed by a consonant. Old Norse orthography — The spelling of the language. Old Norse morphology — The grammar of the language. Proto-Norse language — The Scandinavian dialect of Proto-Germanic that developed into Old Norse. An Introduction to Old Norse — A common textbook on the language. Bayldon, George. An Elementary Grammar of the Old Norse or Icelandic Language London: Williams and Norgate, 1870. Faarlund, Jan Terje. The Syntax of Old Norse New York: Oxford University Press, (2004). ↑ Hammarström, Harald; Forkel, Robert; Haspelmath, Martin; Bank, Sebastian, eds. (2016). "Old Norse". Glottolog 2.7. Jena: Max Planck Institute for the Science of Human History. ↑ Peter Tunstall. Review of The syntax of Old Norse: With a survey of the inflectional morphology and a complete bibliography. Primary source. 1 2 3 4 5 6 7 Adams, Charles Kendall (1895). Johnson's Universal Cyclopedia: A New Edition. D. Appleton, A. J. Johnson. pp. 336–8. 1 2 Article Nordiska språk, section Historia, subsection Omkring 800–1100, in Nationalencyklopedin (1994). ↑ J. van der Auwera & E. König (1994). The Germanic Languages, p. 217. ↑ J. Moberg, C. Gooskens, J. Nerbonne, N. Vaillette (2007). Conditional Entropy Measures Intelligibility among Related Languages, Proceedings of the 17th Meeting of Computational Linguistics in the Netherlands, pp. 51–66. ↑ Haugen, Einar (1950). "First Grammatical Treatise. The Earliest Germanic Phonology". Language. 26 (4): 4–64. doi:10.2307/522272. ↑ Benediktsson, H. (1963). "Some Aspects of Nordic Umlaut and Breaking". Language. 39 (3): 409–431. doi:10.2307/411124. 1 2 Ragnvald Iversen, Norrøn Grammatikk, 1961, p 24 and onwards. ↑ See, e.g., O'Donoghue 22–102. ↑ The word stark in Svensk etymologisk ordbok, "Swedish etymological dictionary"
↑ Tarrin Wills, The Anonymous Verse in the Third Grammatical Treatise Retrieved from Internet Archive January 13, 2014. ↑ O'Donoghue 190–201; Lass 187–188. 1 2 Helfenstein, James (1870). A Comparative Grammar of the Teutonic Languages: Being at the Same Time a Historical Grammar of the English Language. London: MacMillan and Co.
↑ Geir T. Zoëga. "A Concise Dictionary of Old Icelandic — Словари — Северная Слава". Norse.ulver.com. Retrieved 2016-09-04. ↑ "Lexicon Poeticum : Index Page". Notendur.hi.is. 2003-03-08. Retrieved 2016-09-04. Haugan, Jens. Right Dislocated 'Subjects' in Old Norse (Working Papers in Scandinavian Syntax Number 62. 1998) "WPSS". Norms.uit.no. Retrieved 2010-05-02. Haugen, Einar (1950). "First Grammatical Treatise. The Earliest Germanic Phonology". Language. 26 (4): 4–64. doi:10.2307/522272. Iversen, Ragnvald. Norrøn Grammatikk, Aschehoug & Co., Oslo 1961. Indo-European Language Resources The resources in question are mostly Germanic, including two dictionaries of Old Icelandic (English), two grammars of Old Icelandic (one in English, one in German) and a grammar of Old Swedish (German). Old Norse Online, by Todd B. Krause and Jonathan Slocum from the Linguistics Research Center, University of Texas at Austin.